When you work in the types of luxury spaces like the ones the #DoneRightNotEasy crew do, you are no stranger to stunning homes with beautiful views and even more beautiful automation technology. The interior design of a home is one of the most important items on many of our client’s agendas, and how the automation system will affect their overall design aesthetic is one of the main causes for concern we hear when meeting with clients for the first time. Today we will be discussing some of the ways we work together with clients to ensure the interior design of their home is as beautiful as the control system is reliable. Effective interior design is no small task. A great interior designer takes into account many factors such as building codes, health and safety regulations, traffic patterns, floorplanning, electrical needs, interior fittings and furniture choice. These areas of course align directly with Crestron home automation, which routinely touches every part of the home in some way. Making interior design and home automation two very closely related disciplines. 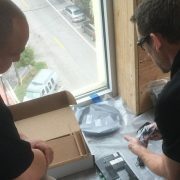 As readers of this blog will know, GMI and the #DoneRightNotEasy crew strive pride ourselves in building beautiful, reliable and powerful Crestron control systems, and in doing so we take great care to maximize the usable space and maintain the interior design elements that meet the customer’s aesthetic. This starts with our system design, and with consolidated and centralized control racks. Rack consolidation starts with the removal of all video content devices from TV locations to a centralized control rack, immediately returning this valued space back to the homeowner for storage and aesthetic purposes, allowing devices and pieces of technology to be second to beautiful interior design. When bringing a Crestron control system throughout a home, even after equipment is consolidated and centralized, work still needs to be done to ensure that all panels, switches and devices meet the specific interior design aesthetic of the end user. This makes wall real estate an incredibly important issue as well. Be it full screen control panels, lighting panels or even televisions, the design and look of a client’s wall requires careful planning when building out a full home automation system. One of the largest devices regularly mounted on walls are obviously television sets. Even the most flat panel high end television can be unsightly if it doesn’t match the aesthetic of the user’s home. 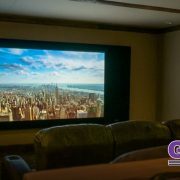 Two ways we get around this this issue are by mounting televisions behind wall art, which can roll away at the touch of a Crestron remote button, or by deploying a projector system that drops down from the ceiling when ready to use. As we have discussed many times, the true foundation of a great Crestron automation system is effectively designed, built and installed shading and lighting systems. GMI and the #DoneRightNotEasy crew’s commitment to a great looking home means that we work directly with you to select the appropriate shade patterns and lighting fixtures that meet your aesthetic. To do so we utilize our in house interior design specialist, who works with both the client and the crew every step of the way to ensure design elements are at their best. It is clear that interior design and Crestron automation go hand in hand towards making a luxury home beautiful and comfortable. It’s easy to see why the combination of our experience, knowledge, and in house interior design specialist make GMI the right choice for not only a great automation system, but a beautiful home inside and out. 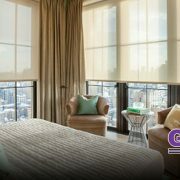 Interested in working with GMI to transform your luxury home? Contact us today to learn more.